Tribbles hell, I've got your trouble right here. Bael's prize for winning Caption Contest 101 was to draw a gremlin holding an Original Series phaser, preferably sporting some additional Trek items as well. So here we have Stripe, having taken Geordi's visor and presumably living it up in the Enterprise D's museum replica of Kirk's chair. Look, I don't ask, I just draw 'em. Hope you like it, Bael! 8 Responses to Tribbles hell, I've got your trouble right here. All I have to say is: AWE-SO-ME! Also, can we have that chair as a background item???? Pretty please????? I really thought about it, Worf. I mean, it’s on its own layer and everything so it’d be easy to import. But … I dunno, it’s so iconic. I don’t know if you can copyright a chair but it makes me nervous. I thought the same thing when I saw the chair. Maybe if you took the armrest buttons off, it would make you less “nervous”. Stripe has a msg on-screen: feed us after midnight–or else! Oh, that’s glorious. Perfect. 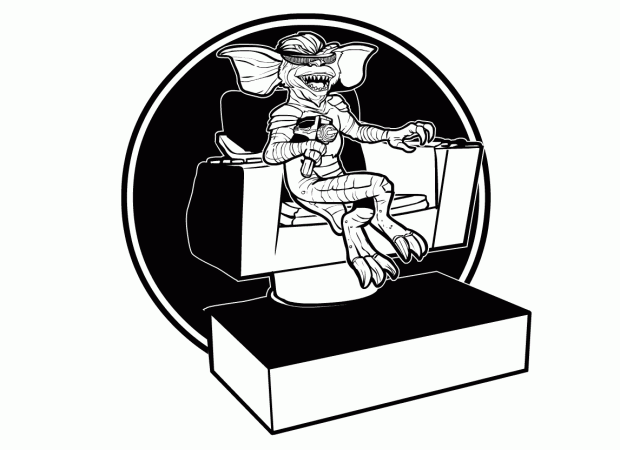 As to motivations, gremlins work better in the TNG venue because they are more likely to solve things with Science!, where Kirk is just as likely to punch it. On the other hand, The original series phasers are much better. The TNG ones look like miniature dustbusters. No. No; just…no. This is too bizarre. This is like trying to work the phrase “My glockenspiel is chock-full of lemurs” casually into a conversation. Not to disparage the artistry or the sheer balls-out peculiarity of the concept, but I’m having trouble imagining creating a Heromachine character that won’t be complete without the addition of a gremlin doing a Shatner impression with an air filter on his snout. Am I alone in this? I mean, whiskey tango foxtrot, already! OK. Fine. I’ll take it as a challenge. I actually considered asking for a gremlin companion, but just one alone (or even half a dozen in the same pose) didn’t really seem all that useful. So, I went with the voices wanted in the first place. Sorry if I broke your brain, but this was mostly just for me.